TORONTO — The day quietly came, went, and Vladimir Guerrero Jr. had not arrived. 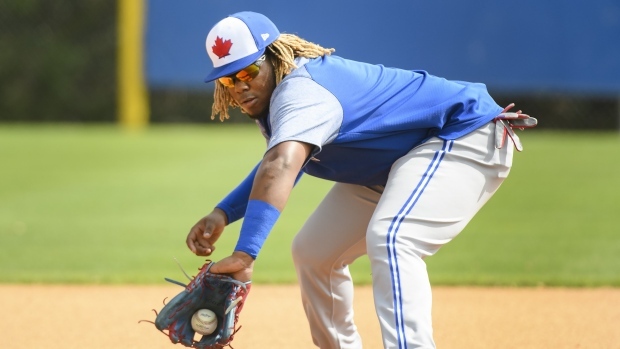 Even though that was expected thanks to the spring training oblique injury that delayed the top prospect in baseball’s start to 2019, everyone still knew what April 12 meant: Vladdy Jr., now under team control through the 2025 season because he can no longer accrue the 172 days needed for a year of service time, can be called up by the Toronto Blue Jays. His home run Thursday night in his Triple-A season debut had people buzzing once again. When is this guy going to show up in Toronto? Jays general manager Ross Atkins made it clear Friday that there’s no set in stone plan, but Guerrero Jr.’s arrival still seems to be imminent, especially now that the injury and service time question marks have both (conveniently) cleared themselves up this week. Behind the scenes, there’s a plan. One Atkins won’t share the ins and outs of with the public. Whether that’s a certain number of at-bats, games, or something else — such as the roster situation with the big-league club making a call-up easy — the Jays aren’t just looking at the nightly Buffalo Bisons box score and deciding if he’s ready. Since his final at-bat of the 2018 minor league season last Sept. 3, Guerrero’s time in the batter’s box has been limited. He had 88 plate appearances in 19 Arizona Fall League games last October/November, followed by the 20 plate appearances he got in Dunedin before the March 8 oblique injury ended his spring. Manager Charlie Montoyo said he’s talked to Bisons manager Bobby Meacham a couple of times already, and he trusts the Triple-A skipper to let him know when Guerrero is ready and back in the flow of things. “He missed a lot of at-bats in spring training, so he needs at-bats,” Montoyo said. As the Jays have done since last summer, they’re being patient, service time considerations or not. Expected to be one of the bright lights in this season’s rotation, Ryan Borucki has experienced yet another setback with his left elbow. After originally being cautious and shutting down a March bullpen session due to some discomfort, the 25-year-old southpaw felt renewed soreness April 3 and received a cortisone injection this week. This setback will shelve Borucki for two weeks, at which point he’ll be re-evaulated. Considering Borucki’s history of elbow problems — he already has a Tommy John surgery on his resume — the Jays will be extra cautious and hope to get him over this hurdle unscathed. Borucki being shut down helps provide some rotation clarity for the coming weeks. With Clay Buchholz set for his Blue Jays debut Saturday, the veteran right-hander will slide into the spot previously occupied by Thomas Pannone, who may shift to the bullpen or even be sent to Triple-A to continue working as a starter. Following the set-in-stone trio of Marcus Stroman, Matt Shoemaker and Aaron Sanchez, Trent Thornton now seems to have some leash as the team awaits Borucki. In the bullpen, Ryan Tepera (elbow) threw a scoreless inning at Triple-A on Friday and could rejoin the Blue Jays bullpen in the near future.